« Nest Check: We Have EGGS! I have never really thought of myself as a birder. I mean, geez, growing up in South Florida in a basically urban environment, there were not many opportunities for me to feed my hidden bird loving tendencies. House Sparrows and Rock Pigeons were the basic “bird de jour” in my backyard. The mockingbird and doves would make a token visit and the glimpse of a Blue Jay or red-bellied woodpecker was enough to send me flying to my diary. As a young girl all ‘black’ birds were the same, but even in this un-exotic location I was observant enough to see that there was a big bird world out there. Beyond my 80 x 100 backyard, I knew there were birds I only saw pictured in books. So it went until I moved to the semi rural area I now call home. Every morning I look out my bedroom window and look out back. A quick glance at the Purple Martins to assure myself that they are in fact still there. I often find myself accidentally birding. Like the time I saw my first Pileated Woodpecker out on the Purple Martins favorite slash pine. Or the Red-Headed Woodpecker that I only see a few times per year, the Flickers, the Eastern Phoebes, the Blue-Gray GnatCatchers, the Bronze-Headed Cowbirds and of course the plethora of Ibis, Egrets, Herons, and other marsh birds that frequent the area. Today was no different. I was amazed by a simple visit to the Purple Martin Gourd rack by a Red-Winged Blackbird. The Martins were all up in arms about the Turkey Vultures that were swooping way to close for comfort. The Vultures, though not a threat were quite annoying to the Martins who were up and back in frantic bursts. 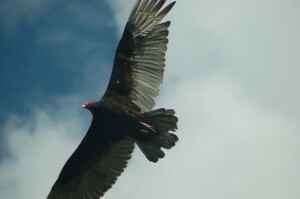 To be quite honest, I don’t think I have ever seen the vultures flying so low to the ground. Then of course my attention turns, as it always does to the purple gems singing in my backyard. Dozens of them. Now with several younger SY birds looking the rack over in search of an open compartment. No shyness with me. No coyness, no attempts to duck and cover from me. Their casual disregard to my approach is as comical as my look; outside, just rolled out of bed, hair in disarray, coffee in hand and a big dumb smile on my face. My transient children that come home to partner with me in raising their young. My Purple Martins. This entry was posted on Tuesday, March 24th, 2009 at 8:53 pm	and is filed under Daily reflections, Purple martins, Wildbirds. You can follow any responses to this entry through the RSS 2.0 feed. You can skip to the end and leave a response. Pinging is currently not allowed.